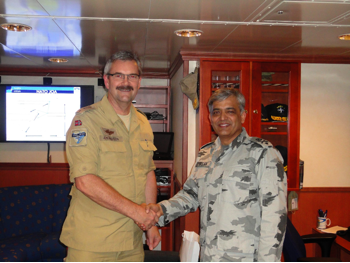 The Commander of Combined Task Force 151 (CTF 151), Commodore Muhammad Ihsan Qadir SI (M) and members of his staff, met recently with his NATO counterpart, Commodore Henning Amundsen, Commander of the Combined Task Force 508 (CTF 508), and members of his staff during a high seas visit to HMoNS FRIDTJOF NANSEN, the CTF 508 flagship. The mission of both CTF 151 and CTF 508 is to disrupt and deter piracy in and around the Gulf of Aden, Arabian Sea, Indian Ocean and the Red Sea. This meeting afforded the commanders and their staffs an opportunity to share firsthand knowledge on the ongoing counter-piracy operations in this important maritime shipping area. The commanders also discussed the importance of working with shore side regional leaders, because ultimately that is where the acts piracy begin and end. The task force commanders agreed that the final solution lies with the coastal states and as a result, each task force plans to engage with key leaders in an effort to ensure that the conditions that breed pirates and acts of piracy are eliminated from the region. Commodore Qadir of the Pakistan Navy began his naval career in 1980 and has held a variety of operational and staff appointments. Specifically, he has served as the Commanding Officer of Mine Counter Measure Ship PNS MUJAHID and Fleet Tanker PNS NASR, Commandant Pakistan Naval Academy, Commander 10th Patrol Craft Squadron and Commander 9th Auxiliary Naval Operations. Commodore Amundsen of the Norwegian Navy began his naval career in 1975. He has served as the Chief of Staff of the Norwegian Task Group, Commander Norwegian Fleet, and Commander Norwegian Task Group. While serving as Commander CTF 508, Commodore Amundsen is also the Commander of Standing NATO Maritime Group 1 (SNMG 1).